Parasailing is a kiting activity where a person is towed behind a boat while attached to a specially designed canopy wing that looks like a parachute. As the boat drives off the person is carried into the air. The person in the air has little or no control over the parachute. 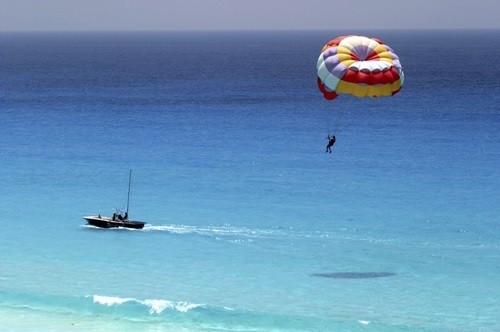 Parasailing is a very popular in Punta Cana it is a fantastic way to see the coastline. It costs about US$ 50 per person or US$ 90 per couple. If you go up early in the morning chance are you will stay in the air longer as they try to advertise this activity to everyone on the beach. To fly alone one needs to weigh typically at least 55 kg (125 lbs) and the maximum weight of a tandem tends to be around 160 kg (350lbs).